The cottage is looking gorgeous. Love the little bed. The bowl shaped finding makes a really effective light - I like the way the light spills out in different directions. That is one sweet dreams bed! How adorable! I can hardly wait to see this house finished! It is coming along so very well. I adore everything you have done so far. Es esa linda cama solo se pueden tener bellos sueños,es preciosa!!!!! Los avances de pintura e iluminación son fabulosos!!! Ciao Caroline, la stanza è molto romantica e piena di dolci dettagli. Mi piacciono anche entrambi i lampadari e buona l'idea del lampadario che filtra la luce a raggiera. I love your bed, it is so girly. You can always give it full throttle and it get always so adorable. Your wallpaper is really beautiful. Hi Caroline! That small bed is to dream for :D!! The house is coming along so well, it looks beautiful so far! Fantastic work! Hi Caroline; your cottage is amazing!! I love the colors!! Es una cama preciosa!quedara perfacta en esta escena! Vos petites maisons sont toujours aussi merveilleuses!!! Le tuto du fauteuil est génial!!! 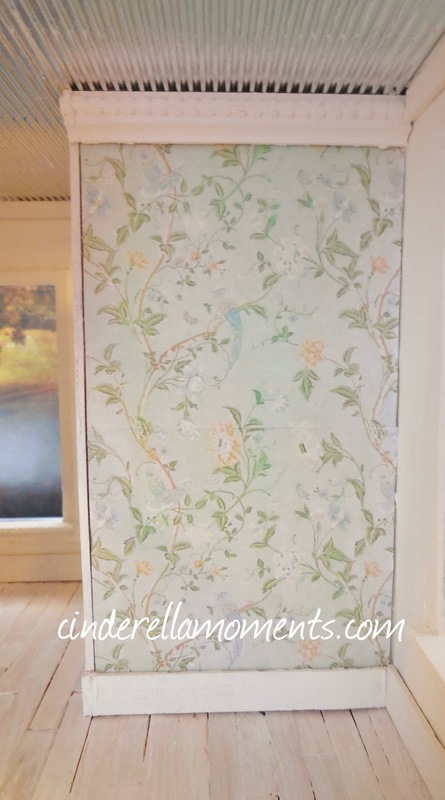 Such pretty florals - it's going to look so lovely. The bedding looks fab all ruched up like that! That is so darling! I just love the little bed and the tiny banner hanging over the fireplace! 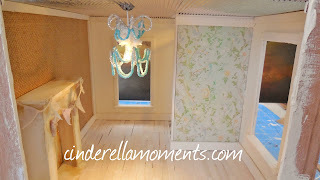 I'm looking forward to seeing it all finished up, I know it's going to be amazing...like all your mini creations! Magnifico, fai dei lavori stupendi. So sweet! A wonderful beginning! Really love this particular chandelier, Caroline! Where do you get your design ideas for your lighting? Love the bed! Great job. I couldn't put together a something like that. Very beautiful and I adore the little comforter/bedding. Gorgeous as always my dear! Keep of the lovely work! Мне нравится лучи света у лампы! Замечательная работа! Esa casita es un sueño de hadas, se ve todo tan dulce. I love the little bed!!! The bed is so cute. I like this beautiful cottage. Me encanta la cama es una preciosidad y los pliegues de la tela le dan un realismo increíble. La ropa de cama es preciosa y quedará genial en esa futura casa. I love this cottage. The bed is gorgeous. Fantastic work. This is so cute!!!! I love these tiny beds!!! Adorable work! What a lovely little bed...every girl should have one like that !! You did a great job...again!! Hi Caroline! The bed with its soft furnishings is a charm! 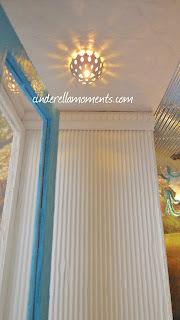 The turquoise chandelier is delightful and it stands out beautifully against the other colours. The little bowl-shaped ceiling light is so special. You always come up with such wonderful concepts. I love the silver ceiling and the diversity of your walls. I look forward to the completed project! I love the bed, it looks so inviting. And the overhead light is so cute! You are an amazing creator! Thanks for sharing. What a cozy bed! 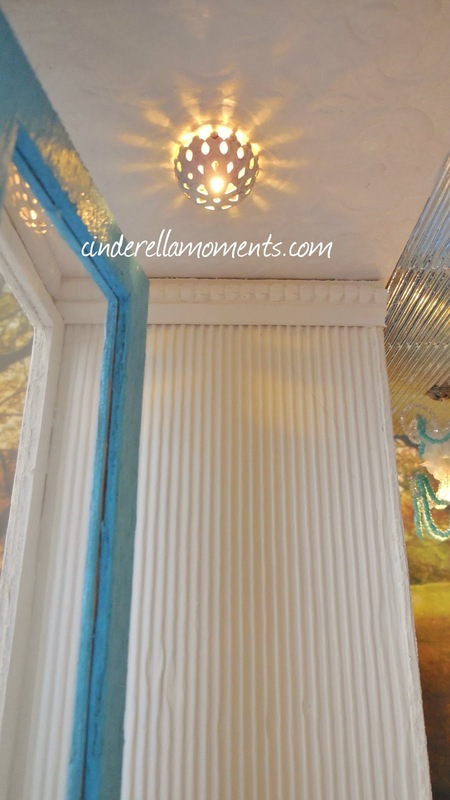 The entry light is beautiful, a great idea. Also love the wallpaper. Hi Caroline, I am trying to catch up with friends tonight. I have been at the nursing home earlier in the day. Adorable is one of the first words I think of looking at the little bed. Your chandeliers are always adorable. Have a wonderful day. Hugs and Prayers from Your Missouri Friend. Hi Caroline! Your Beach cottage is looking Wonderful and I am digging the bed! 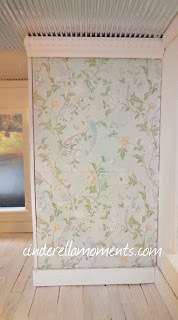 Your choice of bedding is ultra feminine and girly and perfect for the wallpaper that you have chosen. I love the effect the natural light has as it plays upon the walls and the ceiling light is a great choice too! All one needs is the sound of the ocean and the feel of the breeze and we would all be on vacation with you there! La cama es preciosa e ideal para pasar unas noches de cuentos de hadas. The little entry wall with the molding looks perfect !!! Can´t wait to see more.................!!!!!!!!! 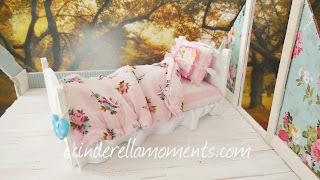 Love this lil bed, it looks so cozy and realistic I just want to climb in for a nap.....and also sweet and girly, a great combination. Have missed you, as I have been a bit busy and not visiting quite as much as usual. ¡Guau, Caroline! ¡Está quedando espectacular! Me encanta, es dulce, es sencilla, es acogedora... muy bonita. Oh this house is soooo sweet! Oh this house is sooooo sweet!